Once upon a time there was a lovely third grader named Toys are Tools Kid Tester #6 who grew up with a loving dad and mom in the suburbs outside of San Francisco. She was an iPad Queen but also liked gardening and drawing. Actually, she was really good at drawing. Her grades were good too. But there was a couple of things she was not so good at - namely, scooting and biking. She never picked it up as naturally as other kids did. Eventually, her parents just sought out to do different things with her. They weren't avid cyclists anyway and so it wasn't a big deal. Still, her mom felt that she could have a much better time with her friends if she could ride a two-wheeler. This past summer, with the help of the Rockboard Mini, her challenges seem to vanish almost instantly. She was eight but didn't even own a scooter. In fact, she didn't know how to ride a scooter (well) nor two-wheeled bike but who one scooter could help bring about so much change. You'd think that the minute Number 6 got it out of the box, she would be rocking and teetering away but she wasn't. She admired her new toy and she worked slowly to get better at controlling her balance on the regular scooting mode so that she could one day shift into the rocking mode. This process took just a few days but Number 6 reaffirmed a valuable lesson for me. That is, new things are cool, different things are cool, but when those new and different things are actually fun, so much is possible. 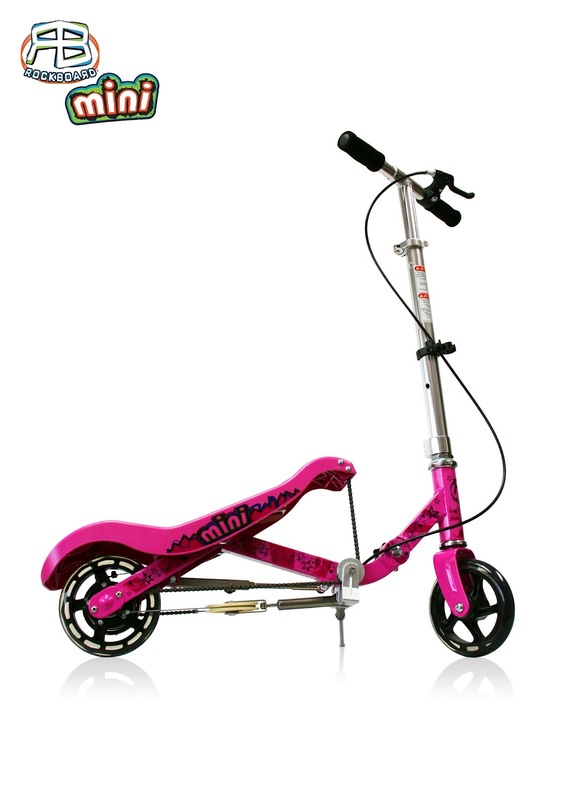 Before using the Rockboard Mini, Number 6 had been apprehensive when it came to riding scooters and bikes. It was really tough for her to even just push and glide on the scooter. She had trouble balancing herself. But with the Rockboard, magic set in. I really think it was the novelty. No one will know for sure but she learned pretty quickly and the next thing you know, she was so balanced that she didn't even need the training wheels on her bike anymore! How cool is she? You would never know that before this summer, she neither knew how to ride a scooter nor a bike. 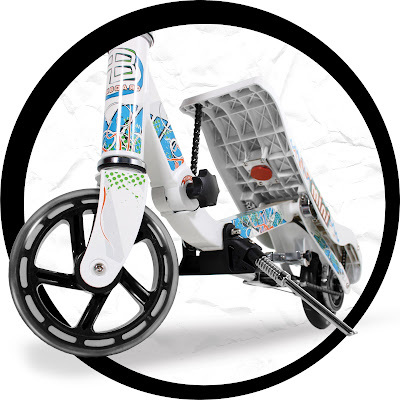 I never really thought about the scooter and what is required to really make a go of it so I asked an awesome occupational therapy expert Aimee Prainito of Prainito Pediatric Therapy in Snellville, Georgia, what she thought of the Rockboard scooter. She was kind enough to watch the video for me to explain to me what children might be working on when riding such a scooter. "It forces trunk stability and control," said Aimee. "You have to have a lot of balance, good visual motor skills, you have to watch where you’re going, because you’re going, stopping and turning. It’s like riding a bike!" Aimee liked the way that children had to stand on it. She also thought it was a good way to exercise a weaker leg if that was something you were working on. What a great idea! When she grows out of the Mini, her mom will definitely consider upgrading. "She can use it. I can use it. My husband can use it," she told me. Let's face it. We all want to get on this thing! I told Aimee with much excitement that I agreed with her. It must be like riding a bike! Even Number 6 was able to ride a bike without the extra support of training wheels soon after she had a Rockboard scooter. Her mother said that she had been scared for a while especially after falling off her bike (with the training wheels) but with the scooter, she learned to gain her balance and just glide without fear. Falling off the scooter is nothing like falling off a bike, right? I never realized that scooters could do that for future bike riders. After learning how to balance on this, losing the training wheels was a cinch. "You have to rock it. Want to try?" Number 6 is also bit on the shy side. Thus, the attention she received from the scooter was very unexpected but wholly pleasant. "I think she kind of liked it," her mom told me. "It gives her attention without really putting her on the spot." To be sure, I know what that is like from the outside looking in. 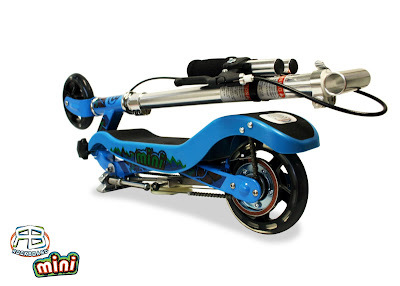 Just a month ago, I was in the park with my kids and another family came by and their 10-year-old son was sporting his new Rockboard (Original) scooter. I was totally wowed but my two kids??? Goodness, they couldn't stop their staring. Number 1 immediately asked if he could ride it but could not since we didn't know them at all. Still, with the scooter as an icebreaker we were all talking and we found out that this boy had saved up four years worth of Christmas money, walked into a Walmart with his parents with the full intention of buying a handheld video gaming system but instead, he walked out with a Rockboard. Why? He decided that exercise was better for him. His mom was proud of him. Heck, I didn't even know him and I was proud of him. So the Rockboard met my expectations as a Class-A Friendmaker in the park as well as something possibly very ideal for the child who is not exactly a scooter-fanatic. Novelty items that are both cool AND functional can inspire any kid to move forward on his own pace and challenge himself. Maybe it has to do with the fact that they don't have to compare themselves to anyone else if they have something that is cool and yet, they are the only ones in the nabe to have it. I feel like there is less pressure to perform and thus allows a child to have more fun and more fun will usually mean better play, right? That kind of better play is not just for kids who want to exercise more or need more motivation to ride. I think those same toys are inspiring for the very athletic kids who love a great challenge. After seeing my son's reaction to the scooter as well as reactions from friends of Number 6, the evidence suggests that the Rockboard also has the power to pique the interest of the very athletic kids. That is the mark of a great toy - one that caters to all skill levels. But what about the price? The suggested retail is $159.99. Is it worth it? Hmmmm... tough question. But tough only because I am not you and you are not me. All I can say is that I have three scooters in my house. They come from various companies in different sizes and weight limits. The most expensive one is $149.99 and it does not have an alternate rocking mode and it also doesn't fold. 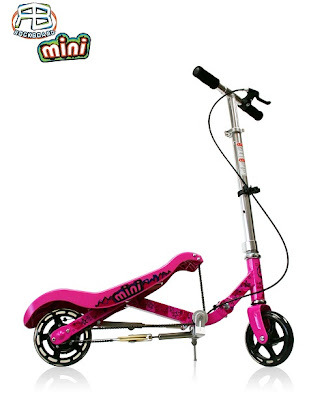 Don't get me wrong, we love it and it is a great scooter because what is most important is that kids are scooting, moving their bodies, and having fun. To meet those goals, some kids could use a little more novelty, a little more exercise, a little more splash, a conversation starter.... In the end, you have to decide if it's a good fit for your family. As far as fun is concerned. Number 6 is having a blast and her mom is quite proud of her. Need it now? Here is my Amazon link below. Disclosure: Toys are Tools has not been compensated by any company to release this information. A review unit was sent to a Toys are Tools tester solely to facilitate a review. Reviews are never promised. Toys are Tools gives a big thanks to Rockboard USA for providing the giveaway prize! Rockboard Radiate Skateboard .... Dd is still struggling a little with a razor scooter, I wonder if this would be any easier. That looks like an amazing scooter! The balance and trunk control it offers would be great for kids who need that extra bit of help. They wouldn't even know that it was working on something for them. And the fun of the unusual design would make any kid the talk and envy of the playground. I'm going to get on my soap box now..... I was very disappointed that your tester is not wearing a helmet in any of the photos. Especially when you talk about how she had balance problems before using the scooter. A fall from standing height onto pavement can cause serious head injuries. Add to that any speed with a moving scooter, and you have a recipe for disaster. Even the Rockboard instruction guide says to always where protective gear, not just a helmet, "always wear a helmet, elbow pads and knee pads. Please be sure to wear long pants, long sleeves and gloves. Proper footwear such as athletic shoes with rubber bottoms must be worn while riding. Never ride barefoot or in sandals"
Here is a link to some info on child safety on wheeled toys. ohmigosh, did you really read the instruction manual! You are so serious! Thank you for pointing out the helmet issue. I have to admit that occasionally I have let my boys scoot and bike without a helmet. Their heads just get so sweaty. I feel so bad for them. But you're right- safety first! BTW, I think you should get on your soap box more often. It's gets us all to talk. 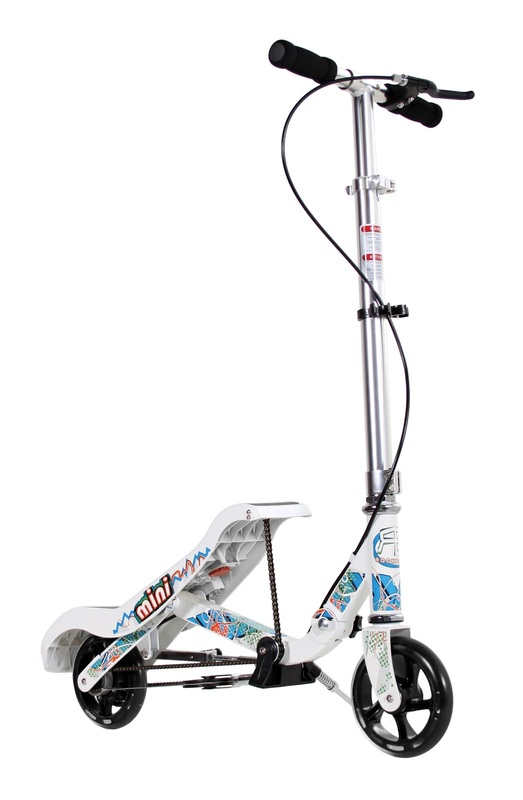 I have a Razor scooter but since our tester is the one who tried it out, it's hard to compare. The one important thing to note is that comparing is really hard to do. Everyone is different and everyone's experience is different. Number 6 actually never owned a Razor and so comparing is very hard. Additionally, you never know her experience could have been different had she owned a Razor before. My point was that she really thought her scooter was special and she took it easy with the learning and that strategy worked out great. One thing worth noting is that I suspect that sometimes balance can't be found due to fear but the Rockboard's brakes are in the front and so you just have to press to break but many scooters' brakes are in the back and thus you must be able to balance and ride such scooters more or less successfully to use the brake. If children know that they can access the brake anytime they want, it might alleviate concerns and thus allow for more attempts at gaining balance and increasing speed. Anyway, I am no professional but if I had to take a guess, I would say that is a difference worth considering. DD has some balance issues so hoping that something like this will help her as it did your daughter. hi Mark, The tester, this time is not my child. Unfortunately, we have no daughters in our home. And again, no one expected such great results but it should be noted that the goal was to ride the scooter and not to work on balance issues and thus, I want to make sure that this part is clear. Still, the question is worth exploration. Whatever the answer, I can't help but think that you will be working on balancing on the Rockboard. It's awesome that it is a toy. What a great scooter! LOVE that it helped that little girl learn to ride her bike. Great write-up, Jenn. This looks amazing Jenn! If I don't win I may have to go out and buy it for my 7 year old. He would love it. I have one who would love to try this out and one who would need prodding but would benefit from it! I think for the balance alone it would be a great ride. I know my daughter would go crazy for it! I love everything about it! We don't have anywhere to store a trike in our apartment, so this would be perfect! This appeals to me for both my neurotypical kid and my child with autism - I like that it helps with balance, as they both need help in this area! Social scene is like a bonus! This scooter looks like so much fun! I think Santa is going to be giving this to a lucky child if I don't win this. Descender looks really cool. I would love to try it in the snow. Just something fun to play with.